From the kitchen of One Perfect Bite...A commitment to support community agriculture can have unexpected consequences. Produce that's locally grown can be unfamiliar or something that you have, in the past, avoided eating. Greens and beans and peppers I never dreamed of cooking a few short years ago, now regularly appear on our table. The only downside to this, is the occasional scramble to find ways in which to cook the new offerings, or the inevitable backlog that occurs with some of the vegetables. Scallions and radishes seem to procreate in my vegetable crisper, so it should come as no surprise that I recently found myself with a glut of radishes that simply had to be addressed. Fortunately, I remembered a recipe for a salad that had originally come from a nutritional program at the University of Texas, Southwestern Medical Center. I had made it once before, and the fact that I still had the recipe was an indication that we enjoyed the salad. While a radish salad may not be to everyone's liking, I can heartily recommend this one for its flavor, crispness and wholesome goodness. It's also easy to make if you have a food processor. The only thing to keep in mind is that the radishes will bleed if made too soon before serving. Here's the recipe. 1) Place radishes in a large bowl. 2) Combine lemon juice, olive oil and cayenne in a small bowl. 3) Pour dressing over radishes, add parsley and mix well. Season with salt to taste. 4) Place one lettuce leaf on each of 8 salad plates. Mound a portion of radish mixture over top of each. Serve immediately. Yield: 8 servings. I am appreciating all these simple summer salads that you share. Mary, you are so thoughtful with your busy blog with so many comments on each post, to take time for your many visit and very sweet comments on my blog. Thank you so much. It means a lot to me. Such a lovely, simple salad. Brilliant. Such a simple, beautiful and refreshing salad.. This is a really nice and simple salad...wonderful for this time of year. Easy peasy and so delicious. Radishes are grown and consumed throughout the world and we can find numerous varieties. Our co-op bag sometimes gives us unusual offerings. Kohlrabi was my nemesis for awhile. When we've received lots of radishes I've tossed them into salads but never allowed them to star. It's about time they did--thanks, Mary. Simple, fresh and delicious that salad! I do think radishes are an unappreciated vegetable -- thin slices in mixed green salads seem to be the order of the day -- but a real radish . . . that is good!!!! We enjoy our fresh radish season on the prairie although it is very very short. Knee is healing fine -- I will be anxious to get back in the kitchen, however! We love radishes in our household--a simple salted radish-butter tartine is a treat. Your radish salad would fall into that same category. Have you seen the watermelon radishes? Great big, with astonishing color, crisp earthy flavor. oh that salad looks great! Simple and perfect for a hot summer day such the one we have today. 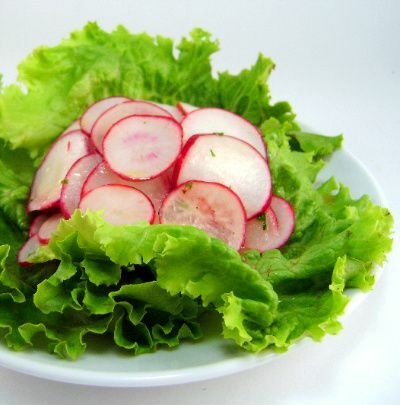 I love the sound of this simple salad with radishes, especially the addition of parsley! I love radishes, usually just lightly salted. This salad would be a colorful addition to a summer barbecue. Looks great, love radishes and never think to do anything with them. I worked at UTSW for years and years, guess I should try it! This is a great easy salad. I've never heard of radish salad and must try it. Thanks for the recipe! Wow! That looks so fresh and crunchy. Beautiful share this morning. I love the simplicity of this salad, and DH and I love radishes. I have never thought of just a simple green with the addition of radishes. So refreshing. Thank you for the beautiful share today sweet friend. I can't wait to see what you have lined up for tomorrow. Am so glad to know about you. It is so fascinating that we share similar interests towards food and cooking. Thanks so much for stopping by my blog. I am loving your recipe collection, they look delicious and healthy. Looking forward to connect with you. Subscribing to your feeds. Happy Cooking, Blogging and Eating. And I am loving this Summer salad. I agree on the CSA thing, I didn't enroll just because I wouldn't be able to enjoy all the veggies and there will be a huge backlog in my refrigerator. Where do you find all of your ingredients? They always look amazingly fresh and vibrant colors. Either magical photography skills or you have some hidden garden that only produces the best! :) Either way--looks delicious! I would guess the lemon juice tempers the bite the the radishes a bit. And, what lovely, fresh colors for the plate. Ravishing radishes! I really need to get into our local CSA. I've been wanting to try it for some time but was leary of the upfront investment. Seeing everyone's beautiful produce though has me quickly changing my mind. That salad looks delicious and lovely! very simple and deliicous salad healthy one too.. i like the lemon pepper parsely combination..
Hello, a beautiful Blog! Cangratulation. Have a nice evening, Cami from Hamburg! I have been struggling to use all of my CSA radishes - thank you so much for this salad recipe! This is so wonderful. I buy radishes every week and just sort of - add them to stuff. I love that you make it the star - and with this simple dressing all the fresh taste shines. I don't know if I've ever had radish. Wow, I never thought of a radish salad. I just always sliced them into my salads. Who knew!?! Thanks for this information. Thank you for this. Happy Wednesday! This is such a beautiful way to highlight the flavor of radishes! it sounds bright and fresh dressed with the lemon juice! I love 2 bunches of radishes at home. Will have to whip up a nice salad like yours! Radishes have long been a favorite of mine and I this salad looks like a perfect summer side dish!! Lovely presentation ~ Beautiful and refreshing salad. I like the crunch and bite of radishes. This salad looks so fresh and enticing. mmmm my mouth is watering over how spicy good that must be! Dear Mary - We can never learn enough ways to use more radishes in our daily eating. So thanks for this recipe celebrating one of nature's most neglected veggies! Mary - Radish salads hold a dear place in my heart because I remember my grandfather growing radishes for me and my mom making salads for me from them. Lovely photo of a delicious salad. I like radishes but they kind of sit in my refrigerator because, I am not sure what to do with them, except throw them in veggie salad. This, in its simplicity stands out.